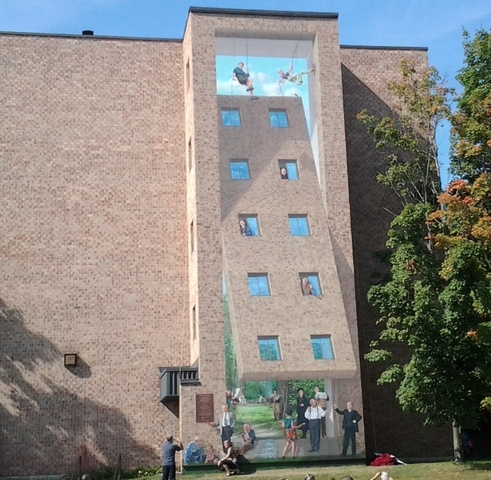 This huge trompe-l'œil depicts the historical origins of the neighbourhood. The first clearing in Sherbrooke took place in this area. In all, there are 17 historical characters illustrating this gigantic historical fresco. Among then is Mr Albert Leblanc (at the bottom right), born in 1899 and deceased in 1975. 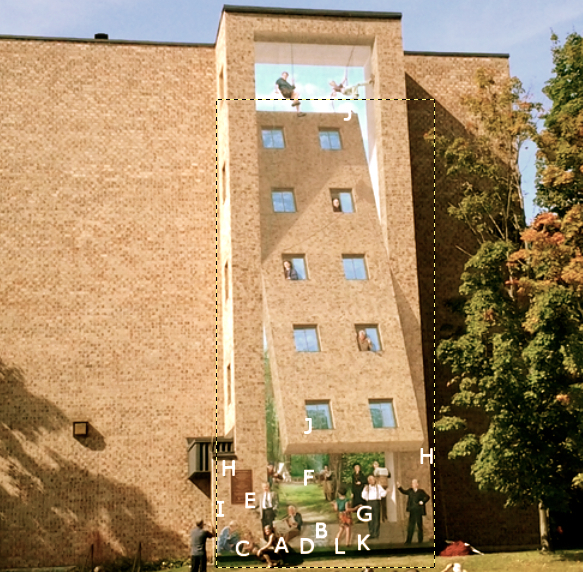 Selected after a call for applications launched by M.U.R.I.R.S., this committed legal expert involved in his community is one of the creators of the University of Sherbrooke project, of which he was the founding dean of the faculty of law. Next to him also stand ten other personalities. 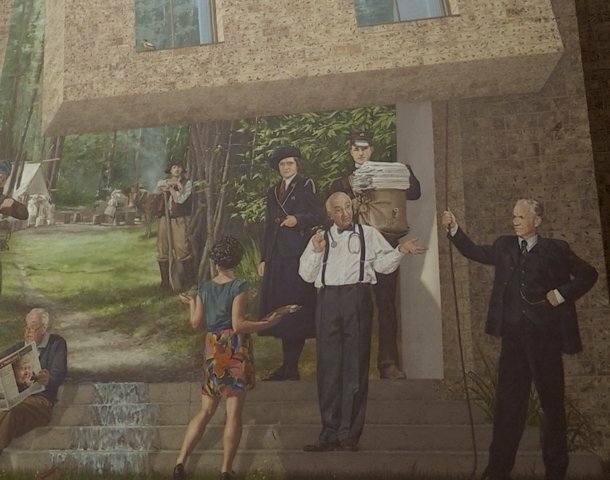 This mural seems to make the time wall rotate on the land and the forests of 1792 to gradually go back to today's urbanity, from Sherbrooke's first origins with Saint-Jean-Baptiste Nolin to the exceptional futures of the other characters represented. 1) Rock Guertin, founder of the Rock Guertin foundation, deceased in 2008. 2) Rachel Lussier, deceased in 2010 (photo in newspapers headlines), one of the first producers in Quebec television. 3) Jean-Baptiste Nolin (in the background) who, in 1975, cleared a 18 acre clearing in the area. 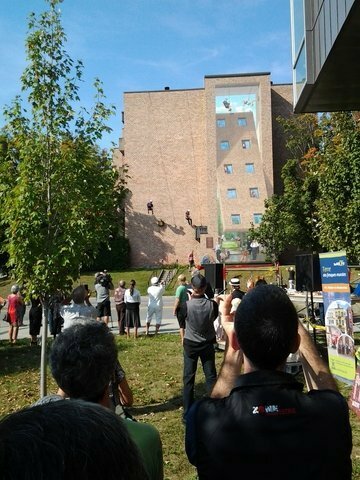 4) Mylène Moliner Roy, an architecture student, intern artist of the MURIRS team for this 13th mural. 5) Blanche-Alice Jarest, deceased in 1985, founder of the first guide unit in Estrie, the female counterparter of the Scout Movement. 6) Alexandre Migneault, deceased in 2000 at the age of 100. Doctor, he helped with 8000 childbirths, 6 of which were his grandchildren. After his spouse died, he became a priest and also baptized 3 of his grandchildren. 7) Édouard-Jean Desruisseaux, deceased in June 1952, first francophone postmaster in Sherbrooke and one of the 8 first mailmen of the postal service inaugurated on September 24, 1907. 8) Albert Leblanc, deceased in June 1952, lawyer and creator of the University of Sherbrooke project. He gathered several personalities around his project of whom Bishop Canada who helped him found the University of Sherbrooke. Origins and Future - Find and Seek!